Another Feast of Words had come to a close at Coonabarabran High School, with the final sessions taking place on Friday afternoon. This year we had a total of five presenters, who all added to the legacy of wonderful words floating around the place, continuing a tradition which began in 2011. 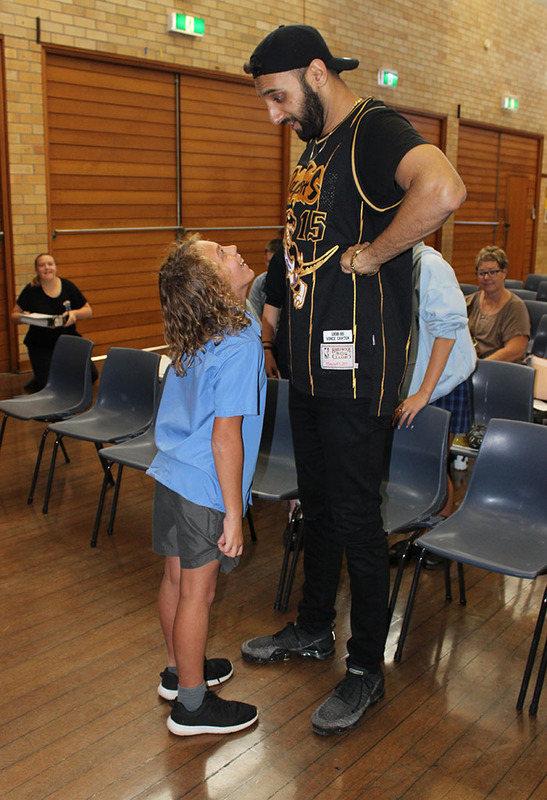 Our Feast sessions began on Wednesday with Year 6 students from Coonabarabran Public School, St Lawrence’s and St John’s Baradine came to the school on Wednesday morning to participate in sessions run by Mrs Michelle Birrell and Ms Natasha Bell. Students learnt how to craft their writing in a more conscious and detailed manner, explored the idea of the hero’s journey and created characters with costumes and dialogue. As always, it was lovely to see Year 6 students prior to their entry into Year 7, as transition events like this allow students to become more familiar with the high school setting, as well as the learning going on in the classrooms. Thank you to the teachers who gave their time in bringing the students to the Feast. Also on Wednesday, Kath Dwyer, a presenter with many years experience in both educating university students and school children, began her sessions on the picture-book medium. It was wonderful to have her skills and personality back in the school, with students from Year 7 through to 12 benefiting from her sessions on picture-books. In a world where visual literacy is more important than ever before, her advice to ‘see rather than look’ at image struck a chord with students, who discovered more about picture-books than they ever imagined they could. In the words of a wise Year 11 student, ‘this is full on!’ The other students around him (and teachers) agreed: but we were all relishing the challenge laid down before us. Kath also in-serviced English and Art staff after school on Wednesday, supporting these teachers to further spread the skill of visual literacy and build a valuable bank of knowledge within the school for future years. Thursday began with journalist Jessie Davies regaling the students with all things bloggy – discussing with them and leading them through activities involved in the publication of words to the outside world. A first time presenter and passionate writer, Jessie’s sessions were dynamic and fast-paced, with students coming away with a vital new understanding of the power of words. Jessie stated that she enjoyed her time so much that she was certain to return for future festivals. Mrs Elizabeth Macintosh held sessions throughout the day exploring a range of texts with students from Years 7 through to 10. When we think of novels or stories, we often think that their power comes from the way a text is structured or the interesting characters created within, but Mrs Macintosh challenged students to investigate the effect individual words have on a story, and see the power that words have to create atmosphere and mood. Paul Stafford helped students develop characterisation in stories, through use of the senses in writing. A successful dinner was held on Thursday night with many members of the school and wider community attending for a great meal at the Acacia Motor Lodge. Chaired by teachers from the high school Ms Shannon Johnston, Ms Natasha Bell and Mr Chris Rollo, all five presenters were able to share an insight into their careers as writers and educators, which made for a fun and entertaining night. Elizabeth Macintosh spoke at length about the history of the writers’ festival, now in its 9th year, and other presenters commented on the ingenuity of the staff of the high school in bringing about and still maintaining such a great opportunity for our students. Thank you to all those who attended the dinner; your support is very much appreciated. Friday morning bloomed and it was time for our final presenters to ‘take the stage’, with Zohab Khan running a boot-camp for selected young writers from Years 7 through to 11. These writers came with pen and paper, and were ready to create, and be entertained by Zohab, whose energy in creating rhyme was engaging and exciting for students. There was some wonderful poetry come out of this session, with ironically eloquent verse themed upon the trials and tribulations surrounding the humble burr (lots of sound incorporated into those poems!). In the afternoon, Zohab took students from Years 10 and 11 through their poetical paces, asking them to replicate the strategies that he uses to start the writing process, such as the brain dump, and the five things about me poems. Students were encouraged to share their writing efforts throughout the day, and what many a student has found a challenge too hard (understanding and writing poetry) became second nature. Published author and educator, Paul Stafford, used the work that students have been completing in their HSIE and English lessons as the basis for his sessions: Year 7 focused on Ancient China; Year 8 on the Viking experience; Year 9 on the events of the Holocaust and Year 10 on the strengths of the memoir form. With his ingenious questioning method, Paul got students to describe the five senses surrounding a situation (taste, touch, sound, sight, smell), getting the students to imagine what it would be like to be there. These were very engaging sessions, with all contributing to the story, and students calling out fantastic phrases which then became part of a greater whole. The final session of the day with Mr Stafford, had a group of Year 8 come up with a wonderful story of a Viking raid on an English monastery, filled with emotion and action, featuring the combined skills of chieftain Ragnar and fighter, Olaf the Stinky (he lived up to his name! Maybe the men were running not so much towards the monastery, but away from Olaf?!). Of course, the Feast of Words would not be possible without the combined efforts of many: Kellie Nash and Mary Doolan for communicating with presenters and organising the T-shirts and accommodation; Duncan Graham for checking of the timetable and organisation; Mrs Pip Danson for publicity and posters; Di Wood, Sue Hincks and Trish Watson for catering; Stephen Turner who was our judge for the student 50 word novels; Michael Armstrong for tech help; James Moffatt and assorted panto tragics for setting up the hall; Michelle Birrell for organising the dinner; the combined efforts of the extended English faculty – Shannon Johnston, Thomas Guihot, Mindy Quigley, Tara Meyers, Mel Jenner and Chris Rollo; teachers who supervised students in sessions; and the students themselves who used their best manners on the day and got engaged in sessions. Planning will now begin on the 10th Feast of Words 2020 – because organising such a wonderful and rewarding event takes time and much effort. Week starting Monday 29 April 2019 will be Week B. This will be a Staff Development Day and will be pupil free. Students will return on Tuesday 30 April 2019. Students and parents can access our new guides for the various HSC subjects. An excellent resource for home study. Please help out by volunteering at the Expo canteen! Support your school! Signup here! The Expo website has moved. Please click on the above link to visit the new website.